Synopsis: An engrossing saga that adds significantly to the body of Holocaust literature. Abrashe Szabrinski used the Yiddish typewriter given to him by his son Joe to record his unique story of survival and courage during the dark days of WWII. 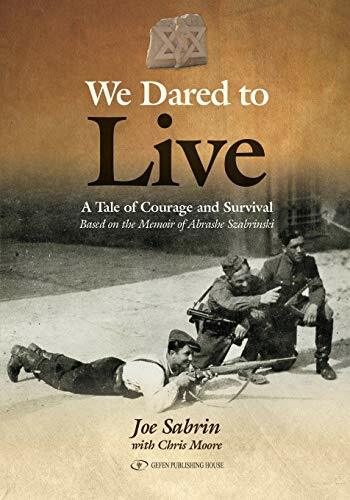 But it was only after his father's death that Joe found out the extent of Abrashe's exploits as a leader of the partisans who fought the Nazis in the forests of Lithuania. An officer in the Polish army, Abrashe fled ghettos and forced labor camps, joined the resistance in Vilna, and became not only a fighter, but also commander of partisan units serving under the Red Army. Alongside well-known figures such as Abba Kovner, he helped blow up bridges, railroad tracks, and munitions convoys, slowing down the Nazi war machine. An outspoken critic of those who headed the Judenrat as well as leaders of ideological movements, Abrashe speaks directly to us. His straightforward, unpretentious style makes his descriptions of heroic deeds his own and others all the more riveting. This remarkable memoir is enhanced with historical notes that help the reader follow Abrashe Szabrinski's journey and learn more about the people he encounters along the way. Like many Holocaust survivors, Abrashe did not divulge the entire story of his survival to his children. Dared to Live is his legacy to them, their children and grandchildren, and to us. An engrossing saga that adds significantly to the body of Holocaust literature.